In the previous two lessons of this section, you learned how to lift your center of gravity while standing, moving and sitting. In the final lesson of this “lifting series,” we’ll compare what happens when you “stand up straight” or “sit up straight” with what happens when you lift your center of gravity. We’ll also learn an interesting trick you can use to illustrate the power of center of gravity lifting. As with the two previous lessons, if you have any concerns about the safety of doing these exercises – and certainly if you’ve had recent surgery – be sure to consult your doctor before attempting them. “Standing up straight” – notice the lifted chest, head thrown back and arched lower back. The photo on the left illustrates a fairly typical response. Notice that the chest is lifted, the lower back is arched, and that there’s quite a bit of overall strain. Experiment with “standing up straight” and see if you can sense these effects on yourself. You might need to exaggerate it a little to detect them at first. What happens to your breathing, the overall level of tension in your body, and your balance? 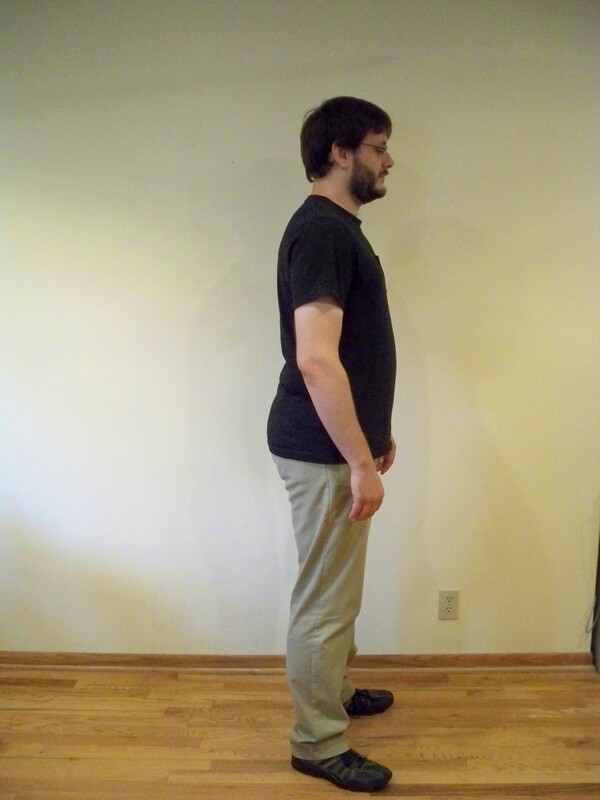 Try walking while “standing up straight” and see how that feels compared to your ordinary walking. Lifting the center of gravity. Compare with the photo above. Now let go of “standing up straight.” Then mentally connect with your center of gravity, using one of the images we’ve explored in earlier lessons, and lift it within yourself. As before, be very clear that your intention is to lift only your center of gravity. Do this for just a few seconds at a time until you have plenty of experience. 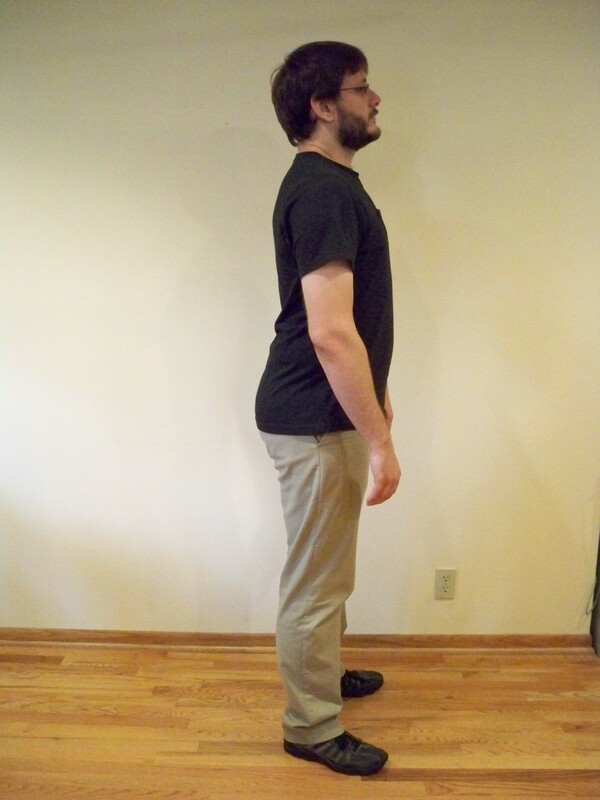 How does this compare with “standing up straight?” Is your breathing any different? Is there a difference in the amount of overall tension in your body? What’s the difference when you walk? As with the experiments in previous lessons, you might want to alternate between the two a few times to get a better sense of the differences. Most students notice that lifting their center of gravity does not generate excess tension elsewhere in the body in the way that “standing up straight” does. Breathing is usually easier, and they often sense an expansion in the chest. They feel taller when they move in this lifted state, and they move more easily. “Sitting up straight” – notice the same tensions as in the top picture. Now, compare “sitting up straight” with lifting your seated center of gravity. 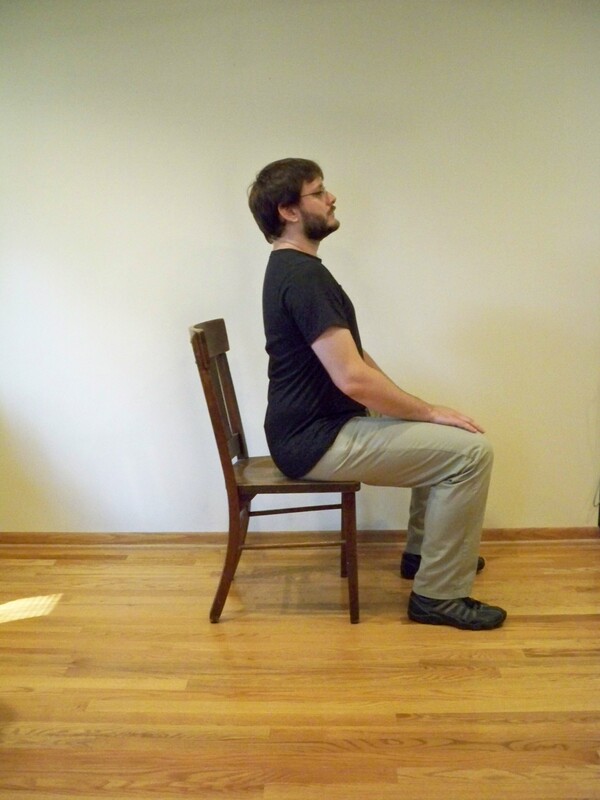 Move back and forth on the chair with a lifted seated center of gravity. Compare this to same movement done while you “sit up straight”. Sitting while lifting the seated center of gravity. He’s now upright, without excess tension. Hopefully, your experiences in this series of lessons on lifting your center of gravity and your seated center of gravity have shown you that this is an effective way of improving the way you stand, sit and move. Here’s a final experiment showing the power of lifting your center of gravity. 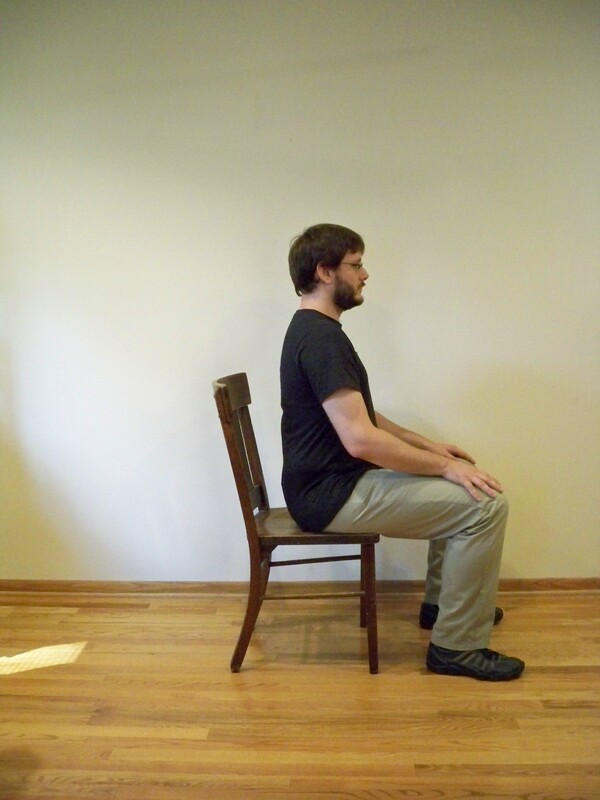 You can do this experiment standing or sitting. We’ll use standing as the example here. While standing, connect with your center of gravity. Now lift it, and only it, as much as you comfortably can. Then, while continuing to lift your center of gravity, try to go into a slump, pulling your chest down and into itself. Now, again while lifting your center of gravity, try to “stand up straight” in the manner illustrated earlier in this lesson. You probably found that it was impossible to do either, at least to any significant extent, as long as you were also lifting your center of gravity. That’s because both of those movements actually tend to lower your center of gravity and it’s not possible to lift and lower your center of gravity at the same time. Students are generally amazed when they attempt this. It’s is a nice exercise to try with your family and friends. This brings us to the end of the basic center of gravity lifting procedures. In the next series of lessons, you’ll learn to use center of gravity lifting in quite a different way – one that’s much easier, more precise, and more powerful. As always, please use the comment box below to share your experiences with these exercises. These lessons were so helpful. I have some neck strain issues from day to day use of cell phone, computer and working out. I do see a chiropractor once every 2 weeks or month which helps. I went through each lesson and performed the techniques and can definitely feel a difference already. Thank you so much, very informative. I also have some digestive issues (IBS), and have a problem with breathing deeply (from stress/anxiety, which we all have but these are the areas where stress manifests for me) and immediately felt a difference internally. I know that posture and breathing play a huge part with internal organs. This is very effective! I’m so glad they were helpful for you Elaine! They’re all in audio format – links on the site. I’m glad to hear about your experience! lying down and center of gravity is also curious. too. so, we can use this for tennis and table tennis? hurray! I’m not sure what you’re asking about – the human center of gravity has been in the same place for a long, long time. Obviously it changes with the transition from monkey to man. How would you go about finding your center of gravity when planking i.e. pushup position? I’m thinking this would improve my exercises if I could locate it. In that position, your center of gravity would be a bit closer to your head, but probably still below your navel and closer to the front of your body. Actually I plan to write a lesson about using this process while lying down. My pushups are much smoother when I’m aware of my center for gravity. Thank you! lifting the sitting center of gravity is good to use. Means….’prevention of raising the chest’ , i think. Fm says, the student should try to secure the thoratic cavity . Disturbance of gravity at this place disturbs the head,neck relationship. Fm says lifting the chest shortens the spine and narrows the back. ‘what is lifting the chest’ ? The lifting of center gravity at this place may be the reasonable explanation . Absolutely right Jagadish – lifting your center of gravity can only happen if either or both of the following happen: 1. your body below the CG contracts (for example, better tone) and 2. your body above you CG expands. That’s simple physics and I don’t see any way around it! hello, I just read through and experimented briefly with your exercises on getting in touch with standing and sitting center of gravity. They are extremely helpful and make me want to experiment further. I might have a couple of suggestions for helping make some of your language clearer, but frankly I don’t have time at this moment to go back and scan for them! But if you write me, I can give you some more detailed feedback. Overall: very good. The spirit of what you are trying to do is excellent and most welcome for me, an autodidact by nature. But I’m aware that you probably are not trying to write yourself out of a job! I’m sure that your next caveat to me will be that, though these self-experiments are helpful, it’s nothing like working with a live coach/teacher. I’m sure that’s true… Anyway, good job and thanks for your efforts!